At a grand ceremony on the Atlantic coast, the CIVITAS Awards 2017 were given out in front of a large audience. The occasion served as a fitting conclusion to the second day of the CIVITAS Forum 2017, which took place from 27-29 September in Torres Vedras, Portugal. 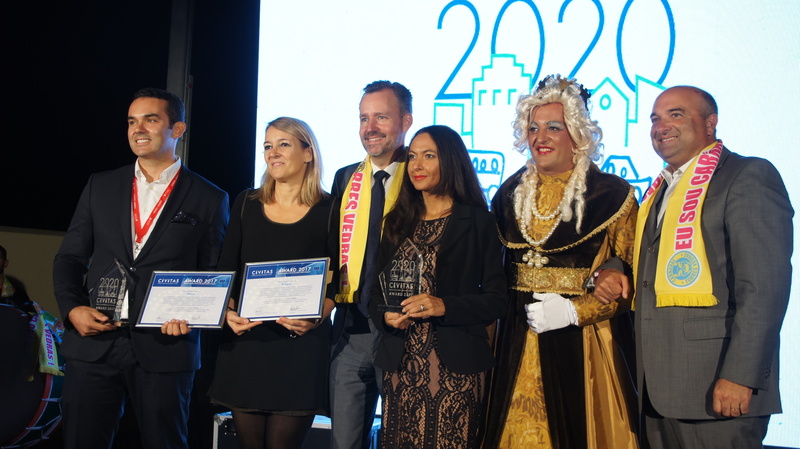 CIVITAS Award: "Bold Measure Award"
This is given to a city that adopts a daring and innovative approach that has not been widely implemented yet, and positions the city as a pioneer in certain thematic categories. "Bella Mossa” rewards the positive behaviours of citizens by giving discounts and prizes every time they complete a sustainable trip, namely using environmentally friendly transport modes or even walking, acquiring healthy habits. Sustainable trips are tracked through the BetterPoints platform, which includes a tracking GPS-based app. The scheme is a a public-private partnership, with 50 shops (small to very large) giving discounts/prizes. The Brazilian city’s Urban Mobility Plan launched in 2015. Part of this includes a new public parking scheme that will be implemented together with a third party company. All the revenue to be paid to the city as part of the partnership must be invested in urban mobility measures: 70% will go to the Sustainable Mobility Fund (FMS) (to be enacted), and 30% to the transit department for use on road signalling and oversight. CIVITAS ‘Transformations’ Award for significant transformation and progress towards a liveable and smarter city through an integrated set of mobility measures. Murcia’s winning entry focused on implementing a whole range of creative measures as part of its ‘Action Plan for the bicycle 2017-2019’. These include: 20km of cycle lanes across the city under the “Murcia Cycle lane project”; the launch of a public bike sharing system called MUyBICI, with 60 stations providing 600 bikes; the launch of the “Moon bike” initiative where cycling tours are organised on full moon evenings; and the launch of “Cycling workshops in parks” to improve citizens’ cycling skills and teach them how to cycle safely in Murcia. At the same time. a maximum speed of 30Kkm/h in 100km of streets in the centre of Murcia has been implemented, electric vehicle charging stations have been installed. and 50 car park places have been created and reserved for electric vehicles only. These measures have been met positively by citizens with 8,500 users of the MUyBICIand and 82,200 moves per month. In the heart of Irun. the Plaza de San Juan has undergone major renovation works, following a participatory process with citizens, to create a new greener, more citizen-friendly square. This includes a 2,500m2 public library and two levels of underground parking. The square is connected via a pedestrianised pathway into the old town. At the same time, the decision to make the whole of Irun a “Ciudad 30” has helped to improve habitability, safety and levels of pollution. The aim of the Awards is to showcase efforts by cities that turn policy into reality. Winners were selected by the CIVITAS, the members of the Award jury, and the Political Advisory Committee. Given out as part of the CIVITAS Forum 2017 conference in Torres Vedras, Portugal, this year marked the 14thedition of the awards.